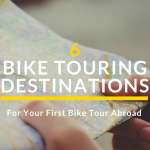 Sure, it’s not the easiest country for a cycle tourist to take on, but for those who persevere the rewards are plentiful. Tim and Mat share a few of the reasons why they think Ethiopia is worth the effort. Although you may not find all the latest gear, there are plenty of ingenious bike mechanics around to help when things start to fall apart. Usually armed with little more than hammer they affect some pretty miraculous repairs. We managed to get a front pannier rack built for us from scratch for about 20 GBP in around 2 hours and it proved to be better than the 30 GBP original. 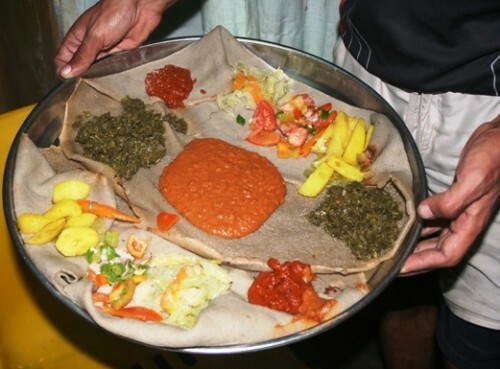 The main meal in Ethiopia is Injura, a large pancake topped with a mixture of meat, vegetables and pickles, great for keeping yourself well fuelled. You can also get spaghetti, really good bread (Ambasha), and great donuts (Bonbalinu), excellent for hungry cyclists. It is great to take a break from the bike by stopping for a lovely brew in one of the small tea (shai) and coffee (buna) shops. There is one in every village where you can get a delicious, hot and very cheap beverage. Some people might be put off by the contour lines on a map of Ethiopia. They don’t lie; it’s an undulating and mountainous country. But if you put in the effort the hills will reward you with some stunning views of a lush, green and beautiful country. If you like being the centre of attention then Ethiopia is the country for you. Everywhere you go with your bike you will pull a crowd, 5-10 people in remote areas but more like 100 in the larger villages. Tim & Mat rode a tandem from the UK to Kenya to raise money for the Turning Point Trust. 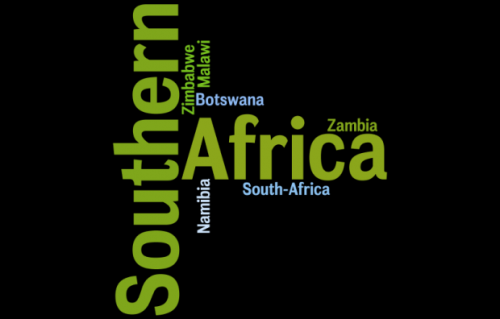 They begin their Africa cycle tour in June 2011 and are now back in the UK after completing their mission. Are you one of those brave souls who has cycled Ethiopia? Please share your experiences. Wow, I have never seen anything quite like that pancake meal.. would love to try it though, great post. 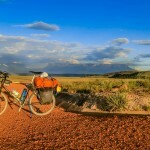 I want to do this but I am probably going to do it on my own without company, can anyone offer advice, also on getting there , will be a long ride from Pretoria in South Africa, so advice on the best and least hassle cost wise to get there would be welcome.